This post is for Wild Bird Wednesday. 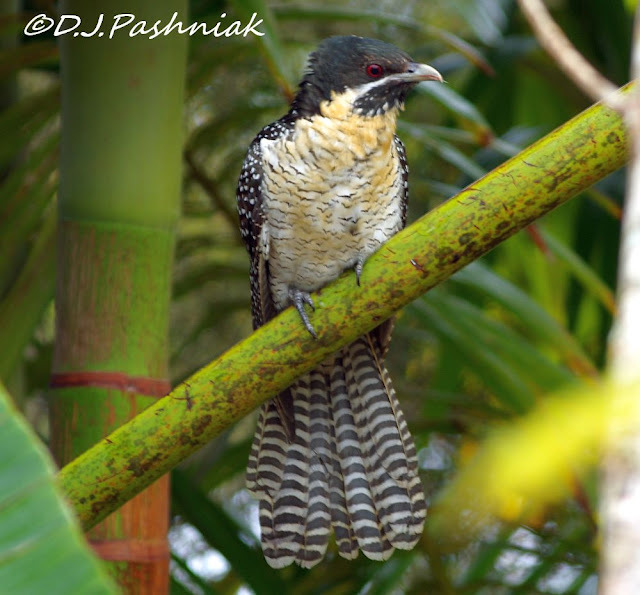 Over the last few weeks the Noisy Friarbirds have almost taken over my back garden so I have become used to hearing their rather harsh voices during most of the day. However, the other morning there was an absolute cacophony of shrieks, cackles, and squarks. (The Dictionary defines cacophony as a harsh discordance of sound and this was exactly what this group of birds sounded like.) In among all this noise there was another 'squark' which I did not recognize. When I went down the back I saw this beautiful female Koel (Eudynamis scolopacea). 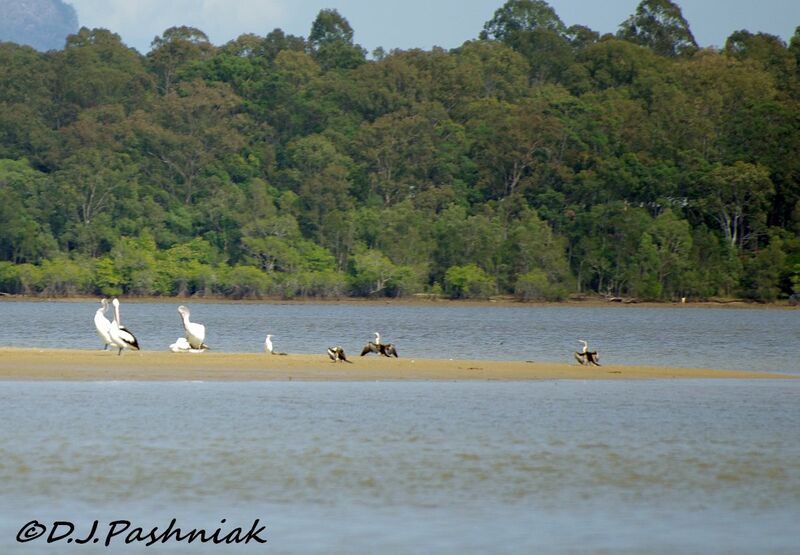 Koels migrate down from Asia and spend the summer here. 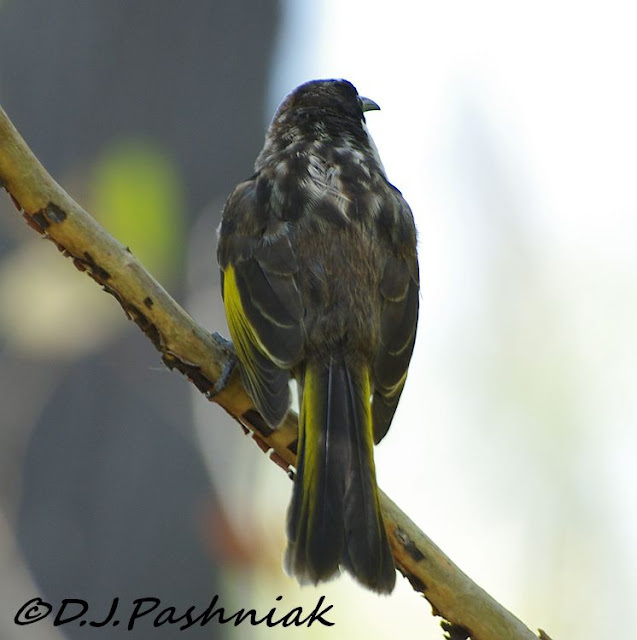 They are cuckoos and lay their eggs in the nests of large honeyeaters. 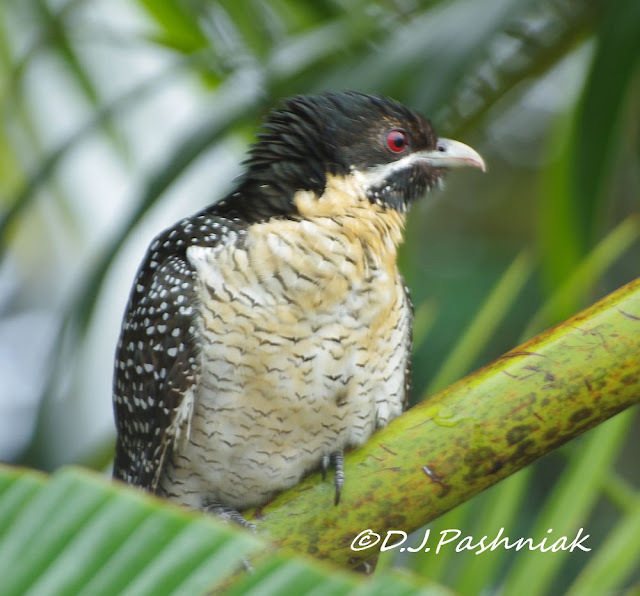 The Friarbirds certainly saw this bird as an undesirable resident of the neighborhood. I feel sorry for any bird having to rear one of the chicks from these Koels. They are so noisy and demanding and it is a full-time job to keep their beak stuffed with food. Since then I have also been hearing the male bird calling close by. This photo is from last year as I have not seen the male close enough for photos this year. Visit I'd-Rather-B-Birdin for more birds from around the world. I went for a walk at Mullens the other day when the tide was coming in. 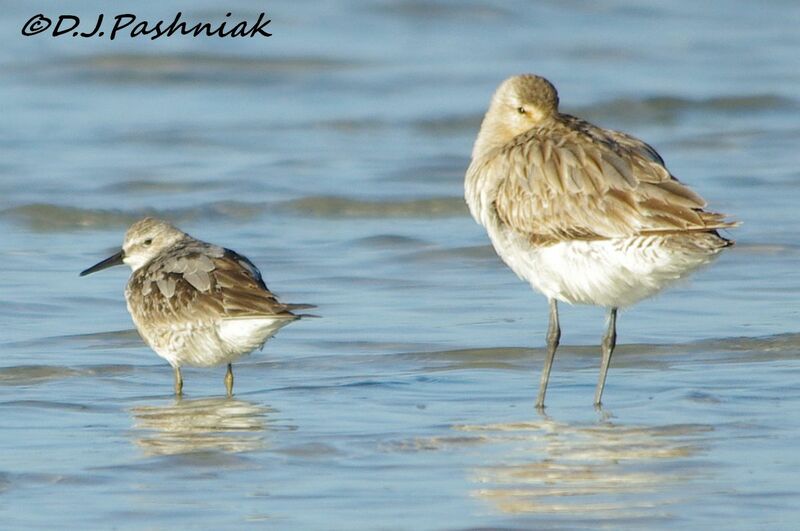 Most of the sand flats were already covered so there were very few birds about. However, the little rocky island at the northern end of the beach often has one or two of the bigger birds roosting on it and this day there was an Eastern Curlew. They always look beautiful with the stretch of water behind them looking across the bay. 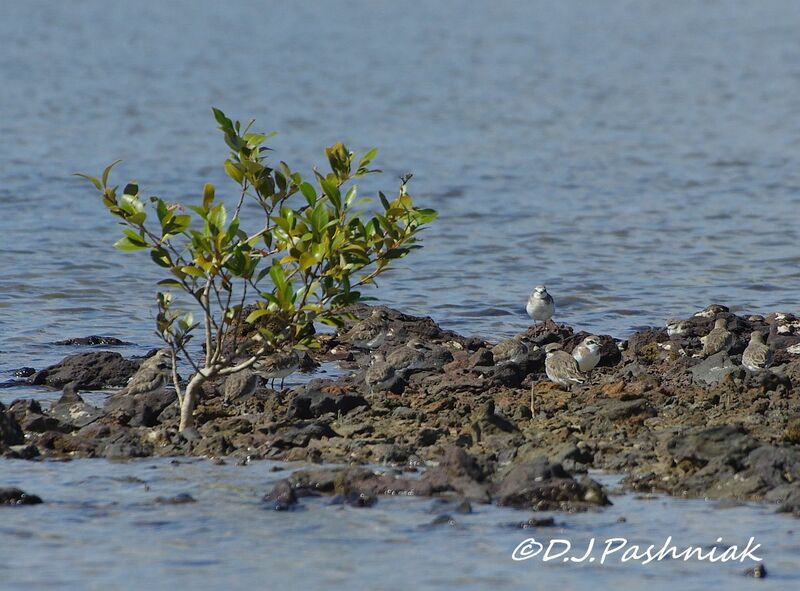 It was only when I looked closer that I realized there were little birds roosting there as well. 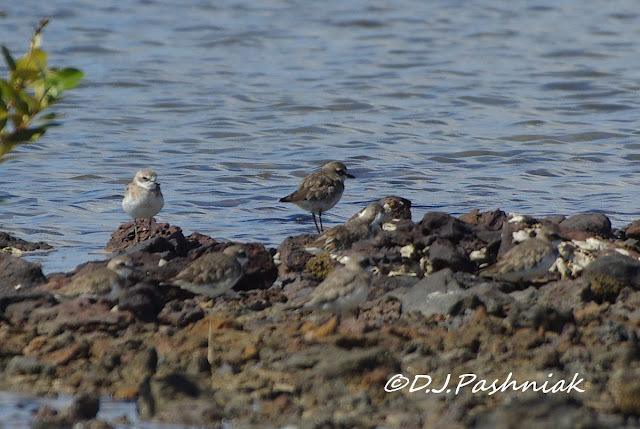 Photos showed they were Lesser Sand Plovers (Charadrius mongulus). We see quite a number of these birds later in the season but they usually roost in at the main bird roost just around the corner from here. However, I saw similar birds in this same place when I was first puzzling about the ID of all these small migratory grey and white birds. It's good to know that they sometimes still use this roosting place. 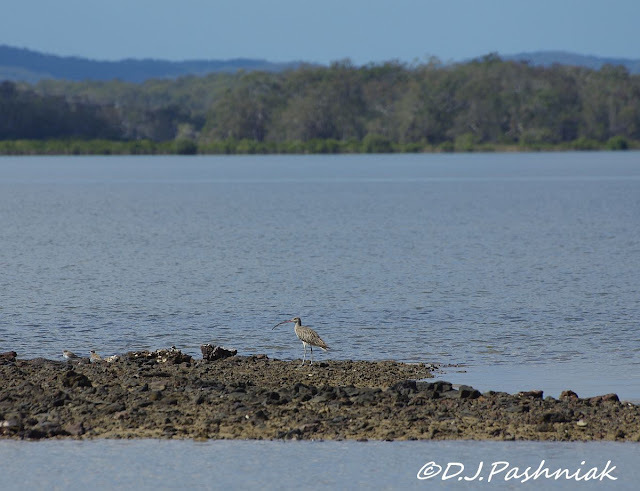 Last week I posted some of the birds I saw as we traveled along the Noosa River on the Noosa River Discovery Tour. It's taken me a long time to sort through the rest of the photos - blame a good camera and a big memory card! Every turn of the river was beautiful and a little bit different and I just kept "snapping" away! 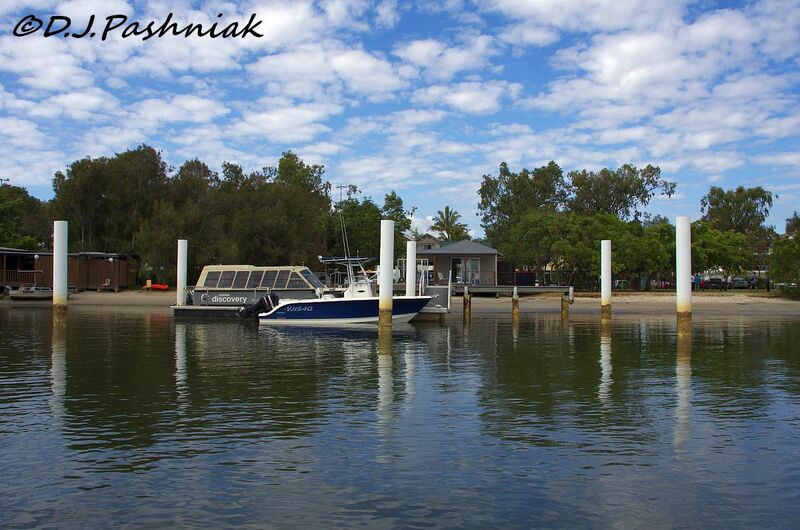 We started the tour at Noosaville. 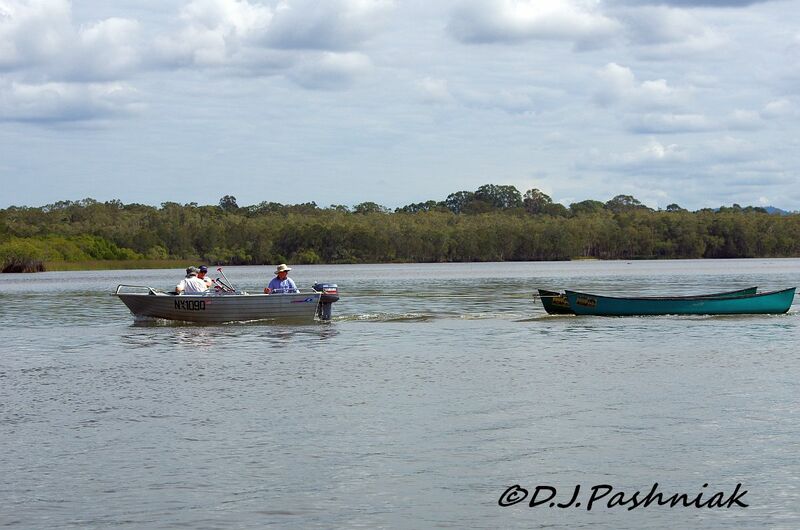 This is the dock and the boat at the back is very similar to the one we were on. This lower part of the river is lined with beautiful and expensive homes and beautiful and expensive boats. 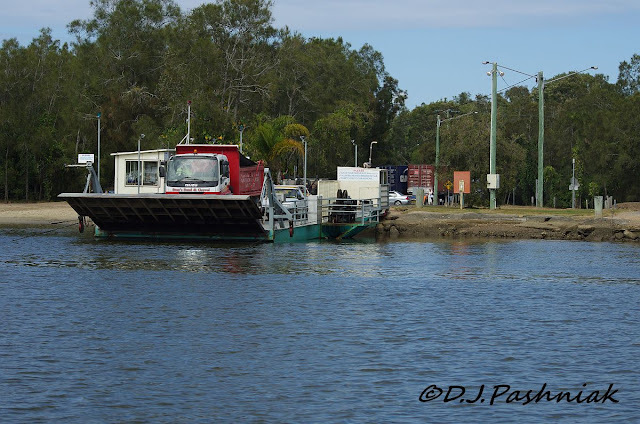 This is a photo of the barge which takes vehicles over to the north shore of the river. Some time ago a decision was made that development on the north shore was going to be restricted and the easiest way to do this was to not build a bridge! 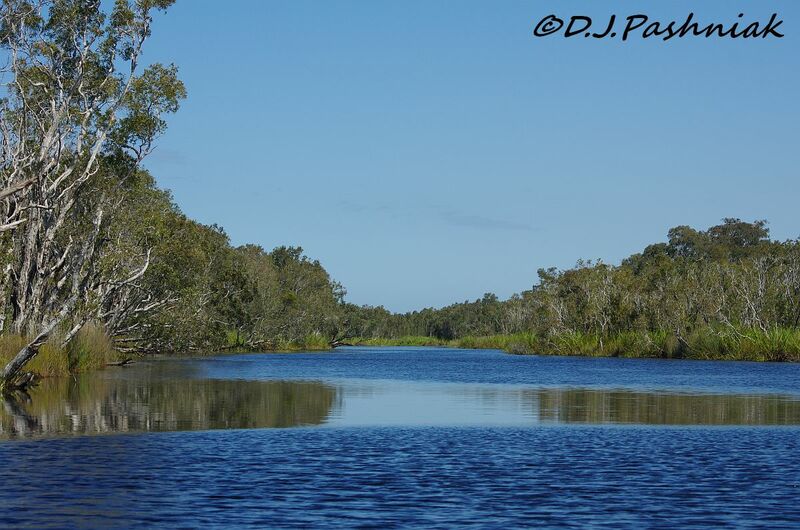 National Park begins just beyond the settlement on the north shore of the river. 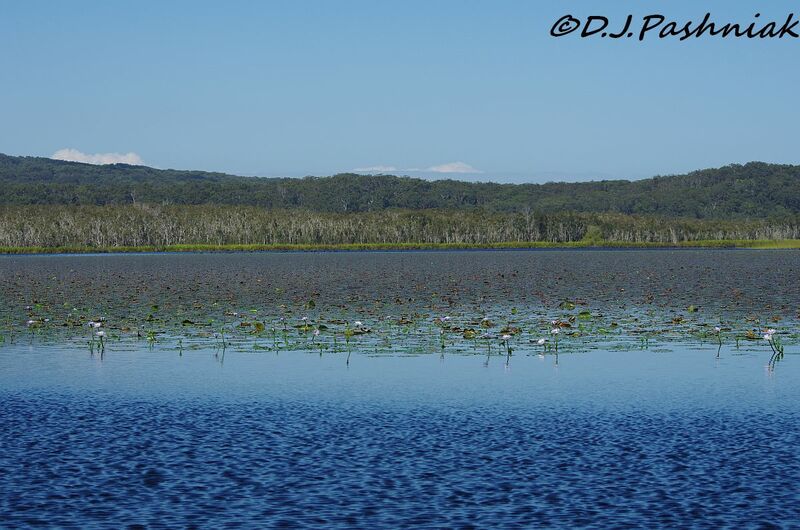 On the west of the river National Park begins half way up Lake Cootharabah. The Park extends to where I live at Cooloola Cove and then extends up to Inskip Point. The only problem - from my point of view! - is that the roads through the park are only for 4 wheel drive vehicles. 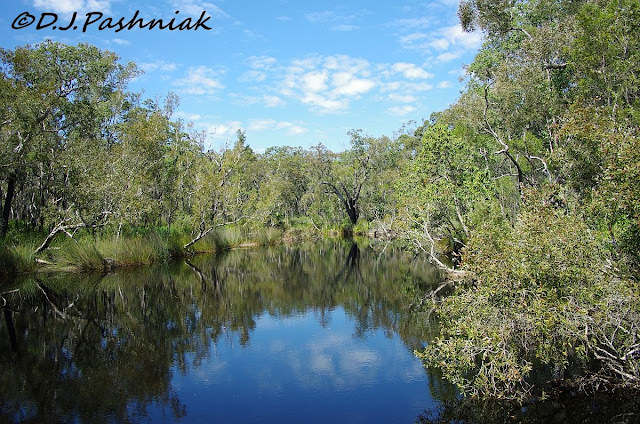 Our route took us up the river, through Lake Cooroibah, along another stretch of river, then through Lake Cootharabah, and then along the upper river as far as Harrys Hut. 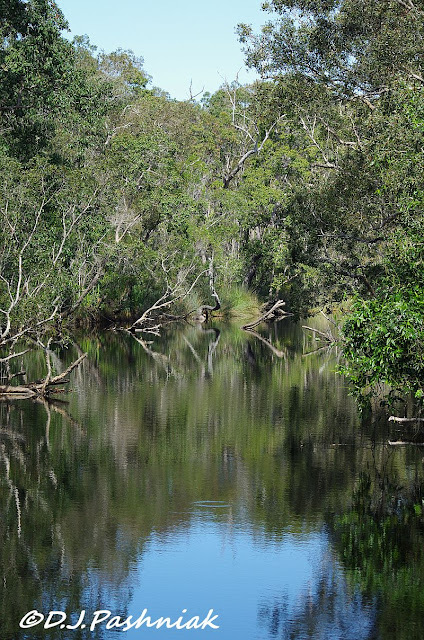 The Discovery Tour web site has a great aerial view from Noosaville right up to Harrys Hut. 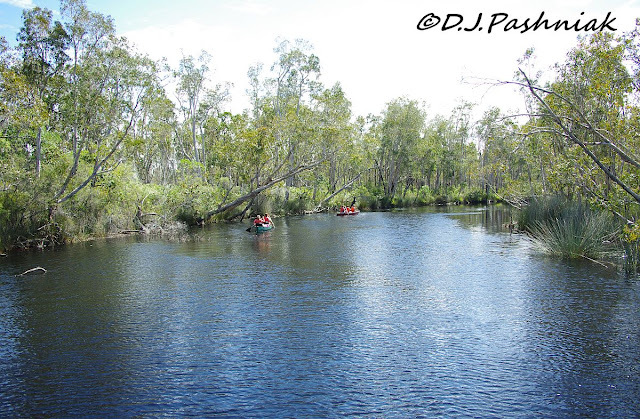 The river was quite wide but not extremely deep. 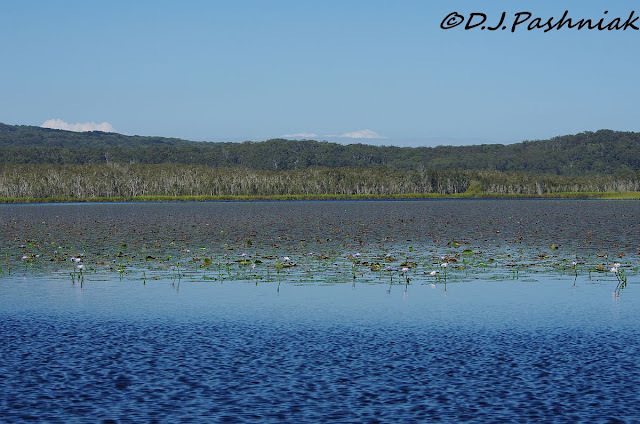 Lake Cootharabah is big but very shallow - the boat driver and tour guide said it was only about 1.2M deep (4 feet). 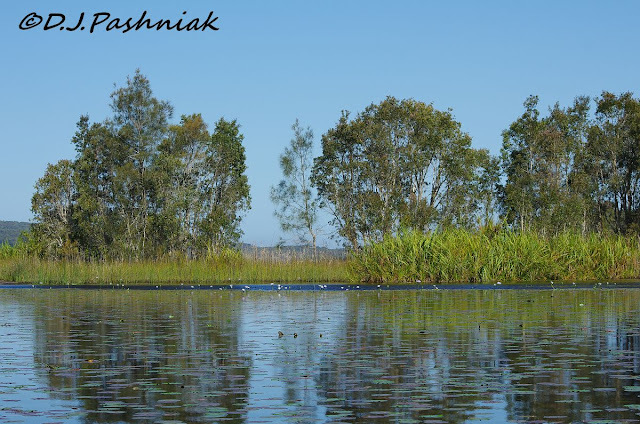 At the edge of the lake there are camp grounds which are popular with school groups. This boat was towing a line of 14 canoes down the lake. 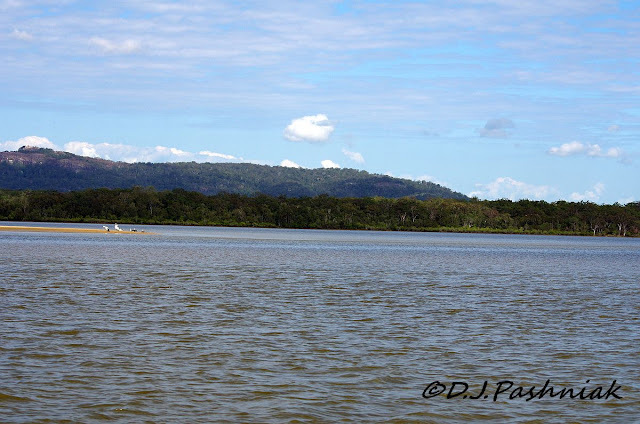 As we were coming home we saw the canoes being paddled back across the lake by a group of school children. 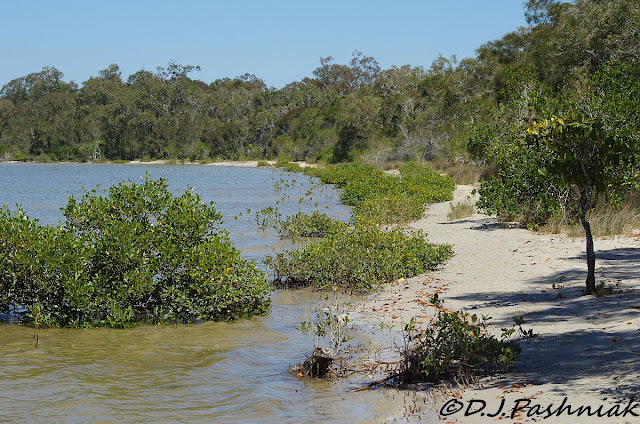 Over the last year or so floods in the upper Noosa River have brought down a lot of sand and then dropped it as the river enters the lake. There is a long sand bank where the channel into the lake used to be and the boat edged up to the southern end of this and most passengers had to get out and walk to the other end while the boat ploughed its way over and through some very shallow water and sand. 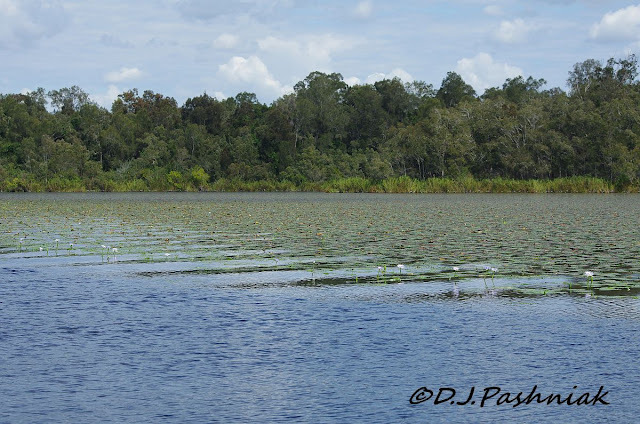 The river beyond this part is still quite wide - but very shallow - and this is where we started seeing waterlilies. 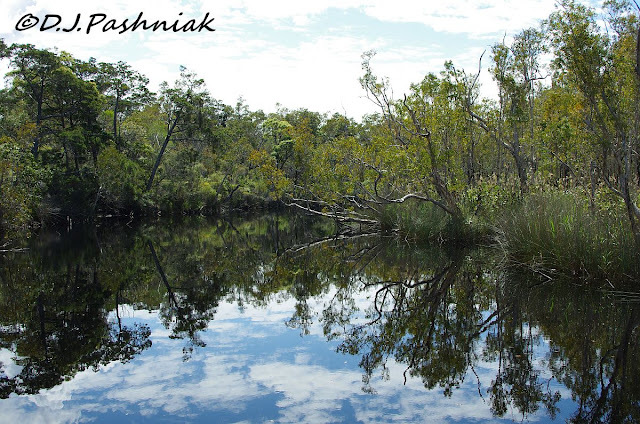 This part of the river is called "the river of mirrors" - and it was beautiful. 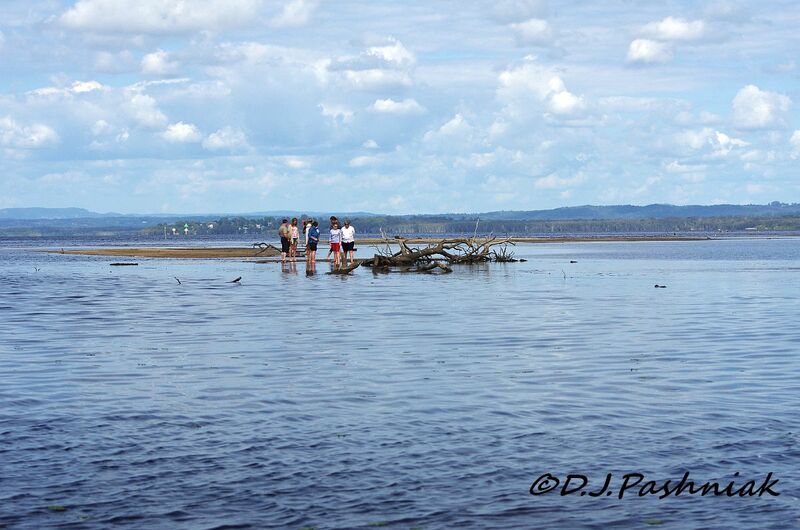 The boat was going very slowly and some of us sat and stood right on the front of the boat to take photos. The tour operators provided a BBQ lunch at the picnic grounds at Harrys Hut. This hut was built in 1957 for workers in the timber industry. 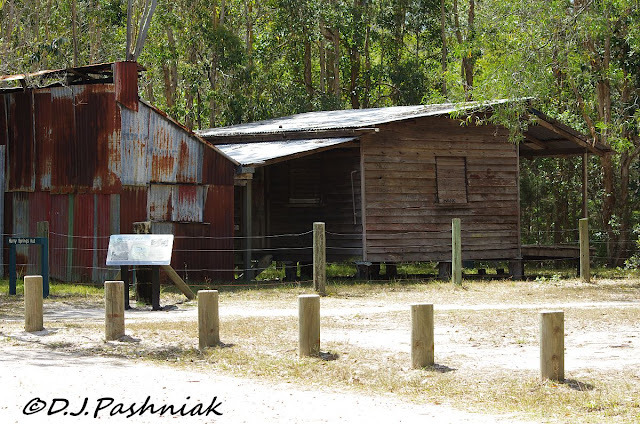 In the 1960s when the timber industry closed down Harry Spring, the pharmacist at Cooroy, purchased the hut from the timber company and obtained a lease of one acre of land from the forestry department. Much later this all reverted to the National Park. We returned the same way we had come up in the morning but by now the wind was getting up and making beautiful patterns on the surface of the water. I will finish with some more birds. 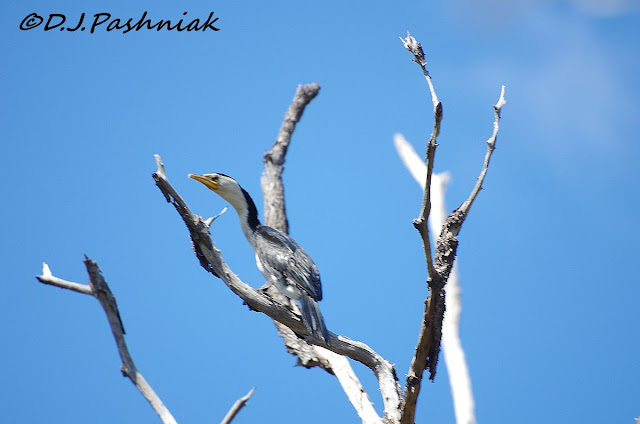 We saw lots of Cormorants all up the river. This is a Little Pied Cormorant. 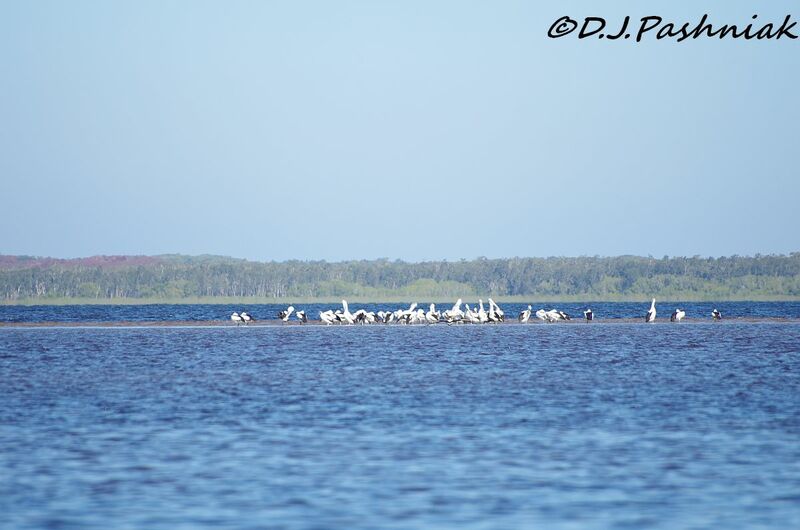 This sand bank had an interesting mix of birds - Pelicans, an Egret, and I think the others are Darters (Anhingas). There were lots of bush birds at the place where we had morning tea - but the only one that sat still for a while was a White-cheeked Honeyeater - and then only showed its back! 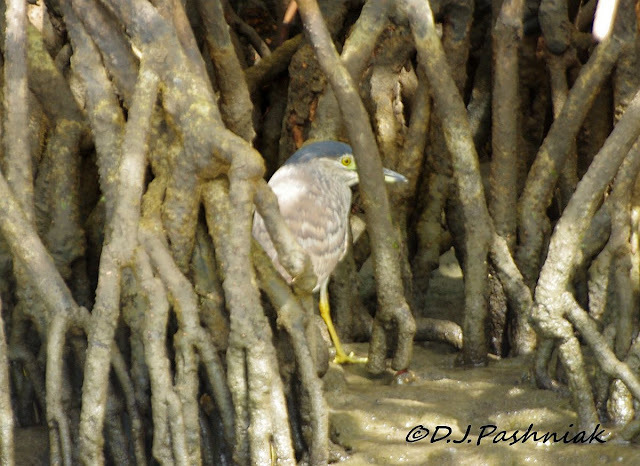 This is not a good photo but it is the only chance I have ever had to photograph a Nankeen Night Heron (Nycticorax caledonicus). The tide was low and the bird was hiding down in among the roots of the Mangrove trees. Mangrove trees must have their roots in salt water some of the time. I spent a delightful day yesterday taking a boat trip along the upper reaches of the Noosa River. I have not yet had time to sort out all my photos so will leave the scenic ones until later and simply post an assortment of birds I saw along the river. The skipper of the boat was very helpful and moved the boat closer to any birds that he thought we would find interesting and also slowed right down. However, I am used to taking photos by myself and taking all the time I need to get settings "just right"! I need to get much faster at changing settings! 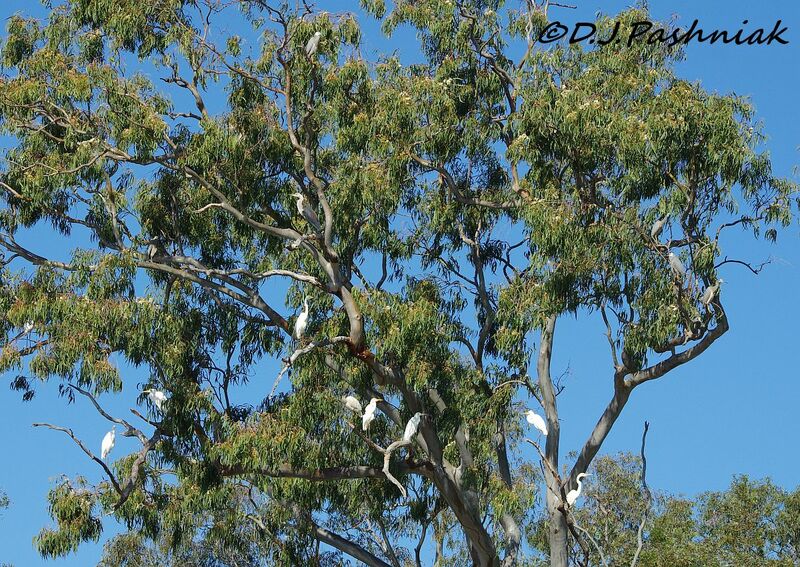 We saw a number of birds using the roots and low branches along the river to roost and hide from passing river traffic. 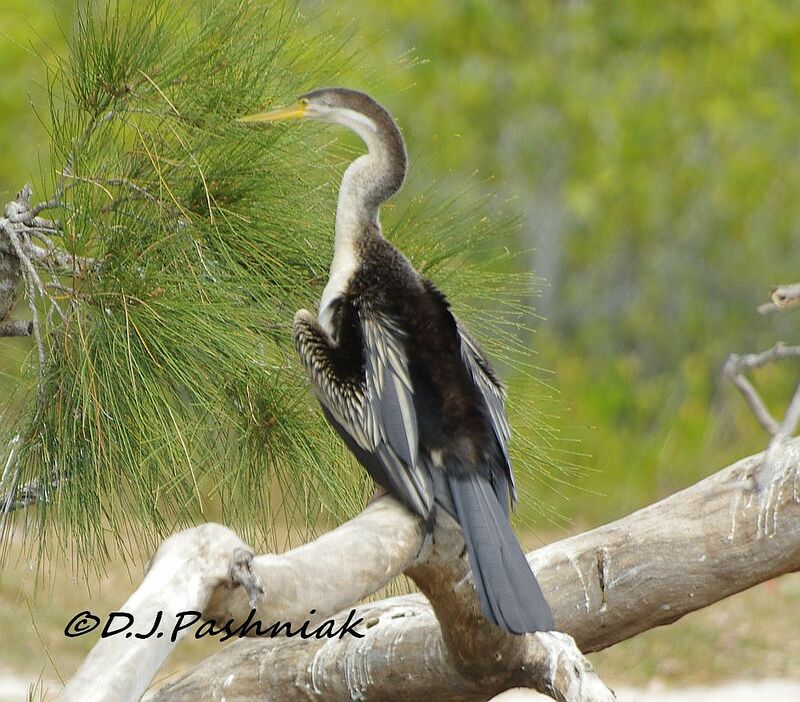 This Australian Darter (Anhinga melanogaster) stayed still for long enough for photos. 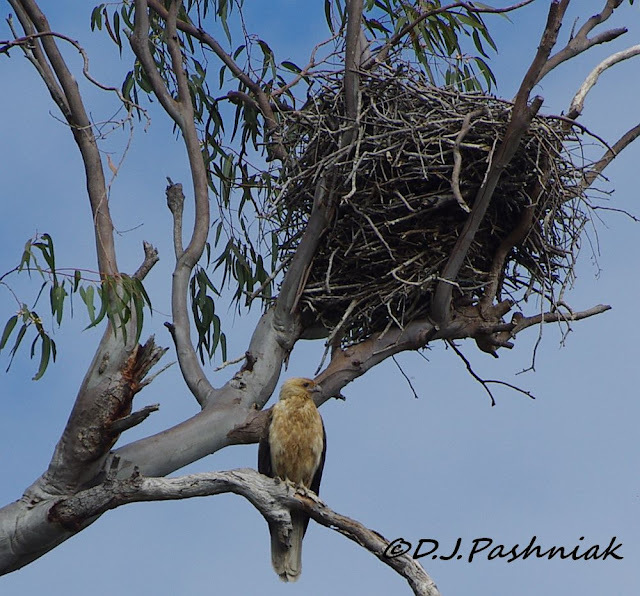 We saw Ospreys, Brahminy Kites and this Whistling Kite (Milvus spenurus) at its nest. 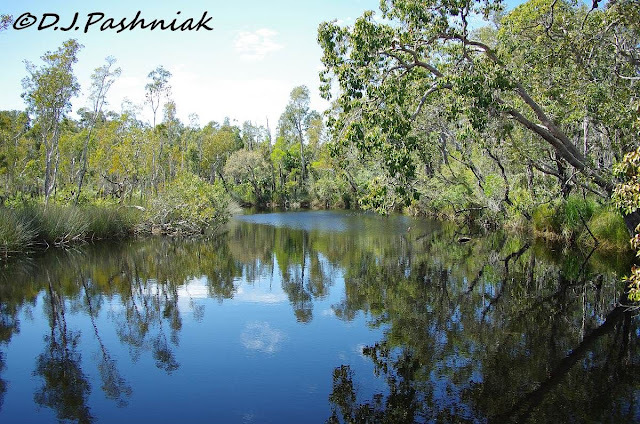 We crossed Lake Cootharaba to get to the upper reaches of the river. There was a large group of Pelicans some distance away and an even large group of Black Swans which were just too far away for any photos. 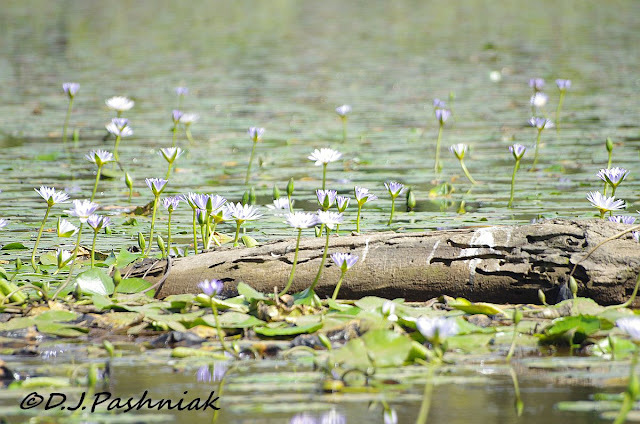 At the far end of the lake there were huge areas of lilies growing in the shallow water. One of the other people on the boat spotted this Comb-crested Jacana (Jacana gallinacea). Unfortunately that side of the boat was looking into the sun. 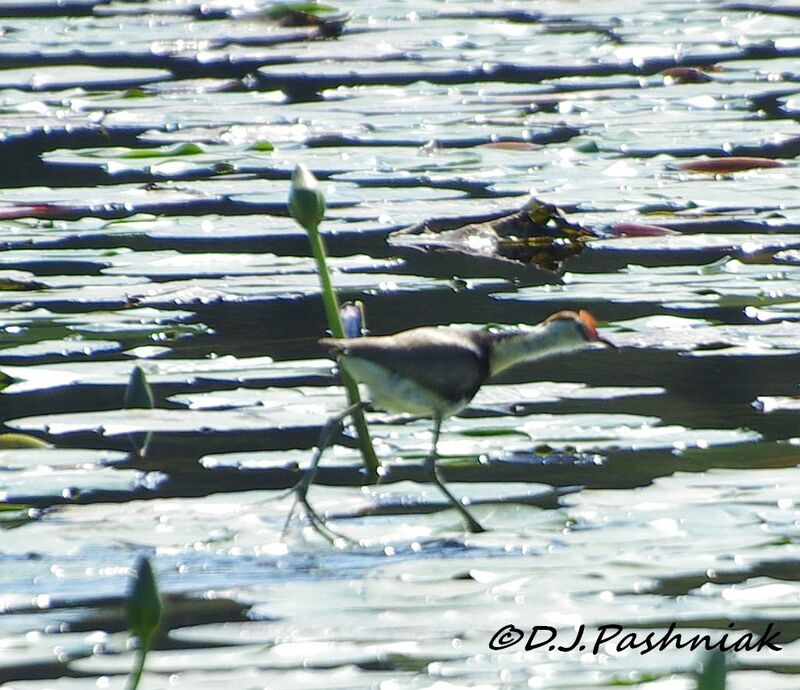 Jacanas have huge feet specially to walk around on top of vegetation floating on top of the water. On the way back down the river we saw this large eucalyptus tree with a most unusual assortment of birds perched in it. I counted 8 Great Egrets, 4 White-faced Herons (the grey colored ones in the photo) and one Darter. 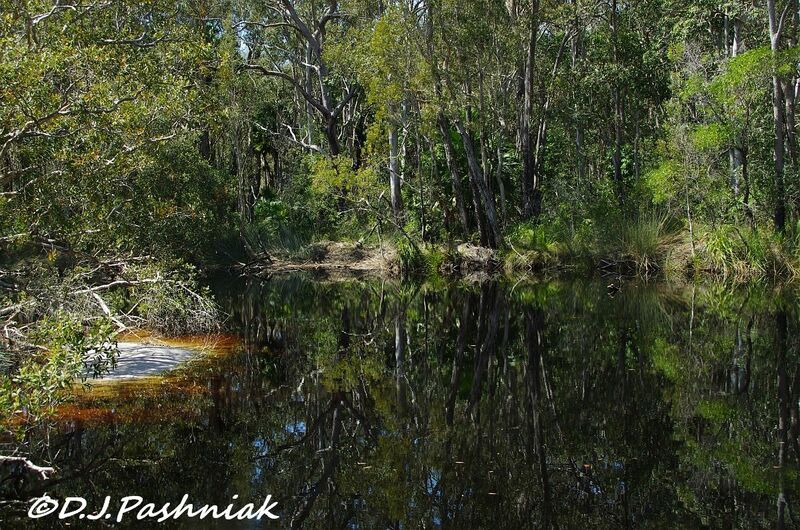 The scenery along the river was magical! The tourist promotions call this the Noosa Everglades. More next time - as soon as I have time to sort my photos! I went over to Norman Point a week ago. There was a small group of mainly Bar-tailed Godwits roosting in the curve of the bay just south of the point. Instead of just resting and sleeping as they usually do most of the birds were preening. As the tide went out and there was more soft sand exposed some of the birds started feeding. 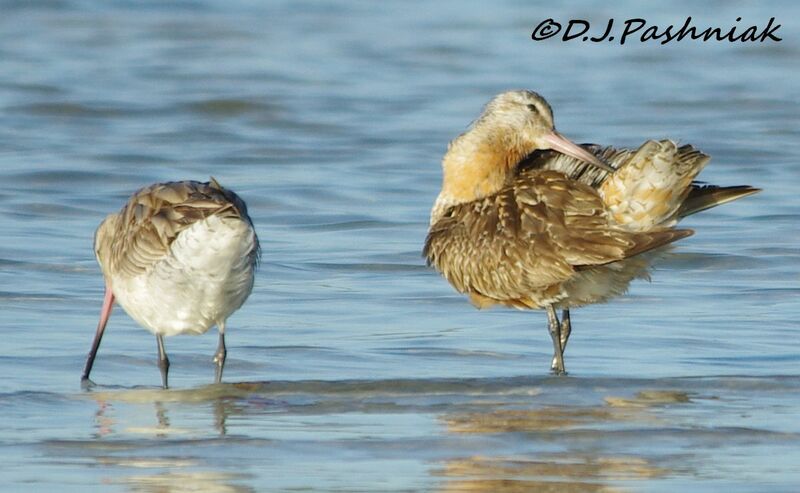 The bird which is preening (on the right of this photo) has quite a lot of reddish breeding plumage left. I am told that birds which have failed to breed return from the northern hemisphere before the other birds. I have not been out to check the roosts this week but up to the end of last week the big flocks of birds had not yet returned from the north. 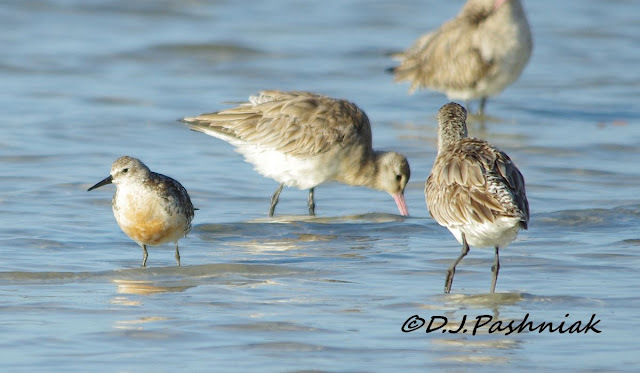 In among the Godwits was one very much smaller bird. Although I have frequently seen groups of small birds roosting quite happily almost under the legs of Godwits, this bird kept moving as soon as a Godwit came anywhere near. Maybe it was uncomfortable because it was alone. The red down its front made ID easy. It was a Red Knot still with a little breeding color. The back and sides of the bird showed pale colored new feathers. 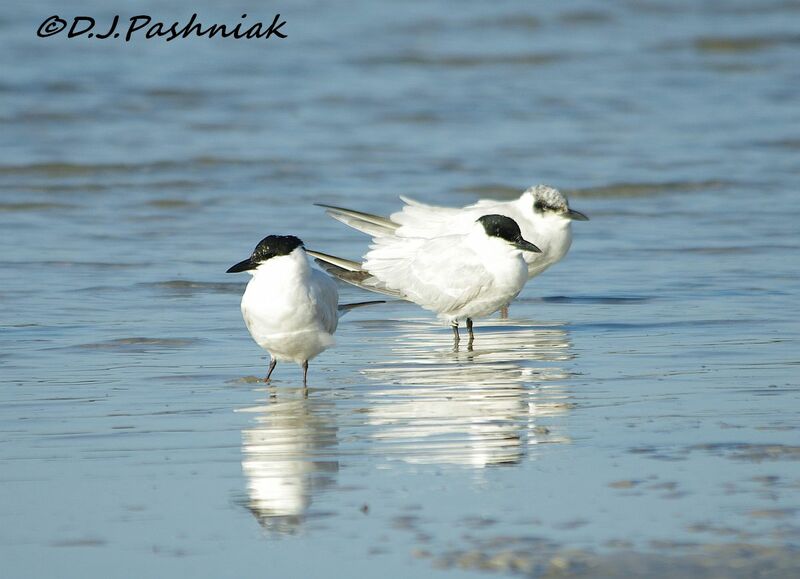 Non-breeding plumage is much paler. 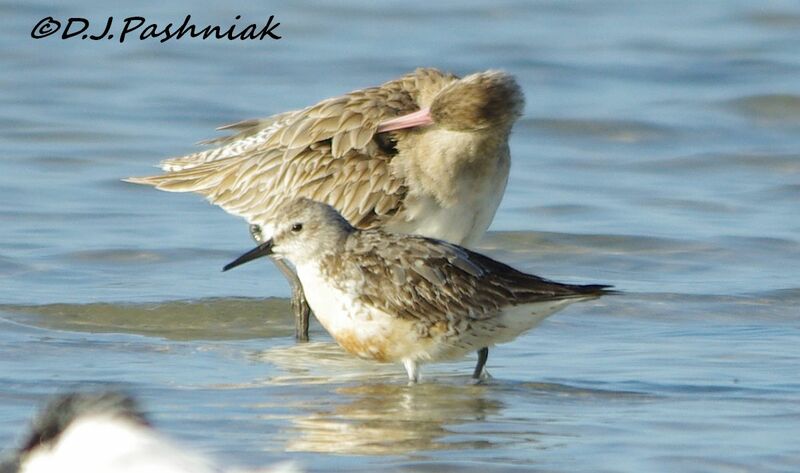 Even this Red Knot stopped and preened every once in a while. The white blotches in the foreground of some of the photos were Gull-billed Terns which were closer to me than the shorebirds. 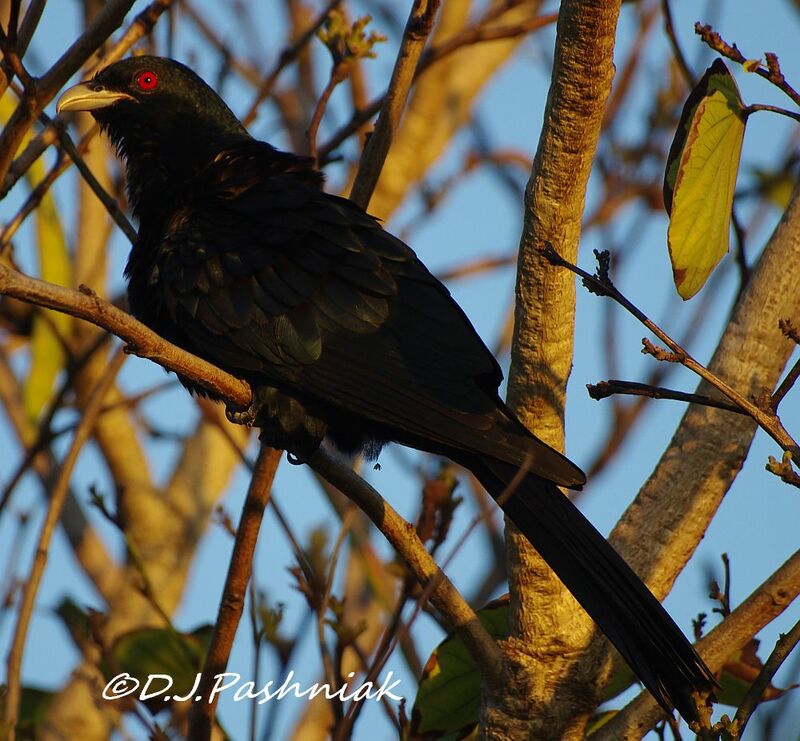 The black cap is full breeding plumage but in non-breeding plumage most of the black is lost and they are left with just a black patch around the eye. 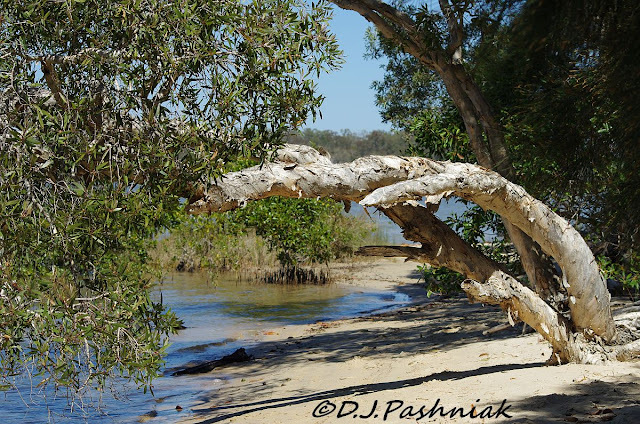 My favorite bay-side walk is along from the Mullens picnic area. The tide was well in the other morning but there was still plenty of sand to walk beside the water. 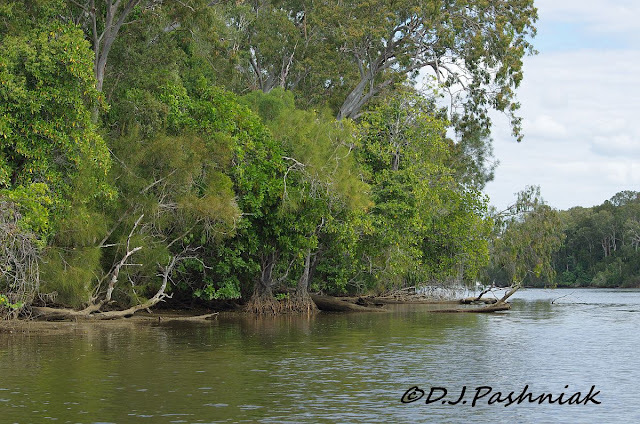 There is an interesting variety of trees and shrubs beside the water. 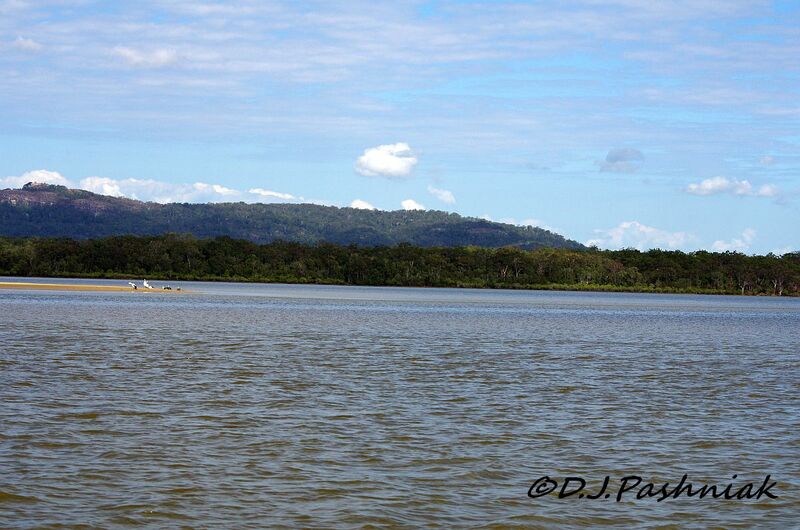 All along the edge of the sand are mangrove trees. 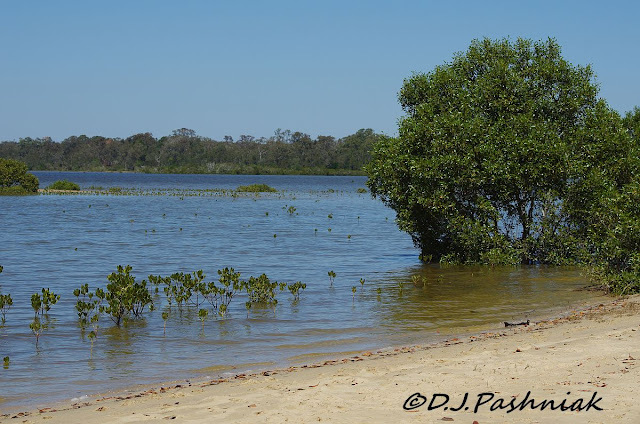 There are a number of different varieties of mangrove but they all like to have their roots in salt water for at least some of the day. 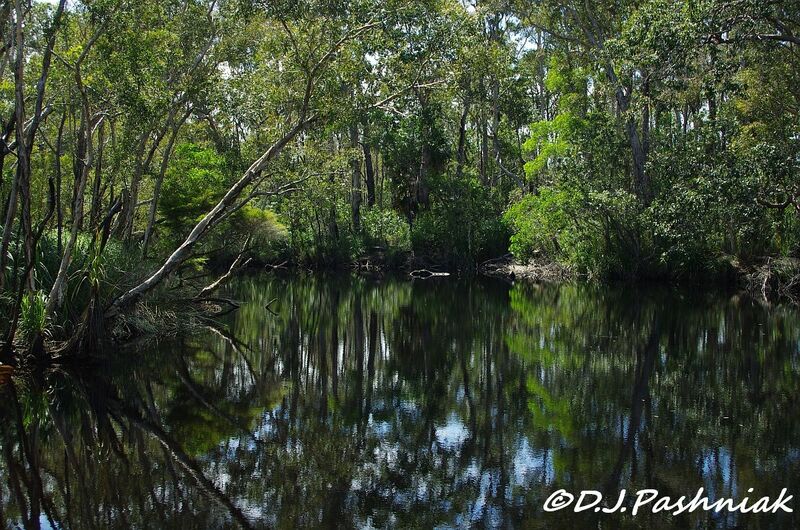 They vary from quite large trees to tiny little plants just poking their leaves up above the water. 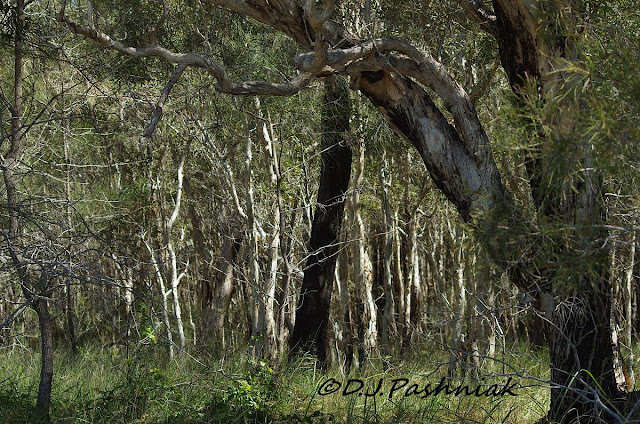 The land close to the bay is very low-lying and quite swampy - perfect conditions for Paper-bark trees. 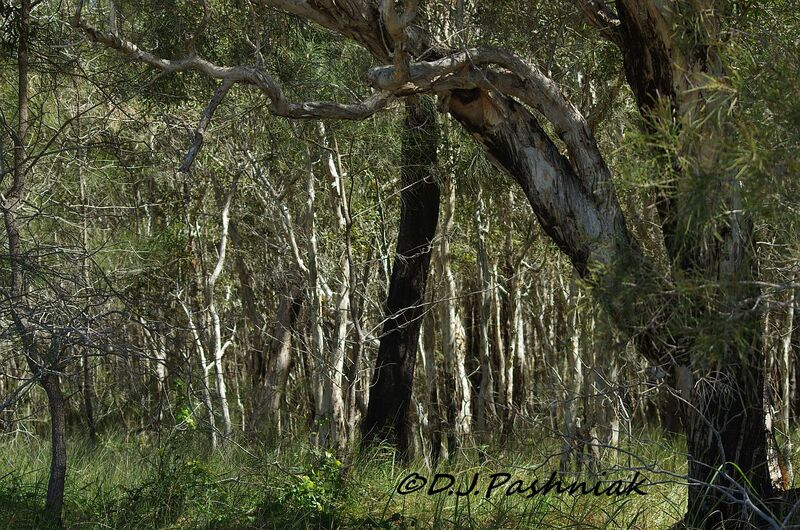 These are trees in the Melaleuca family that get their common name from the way they shed their bark. 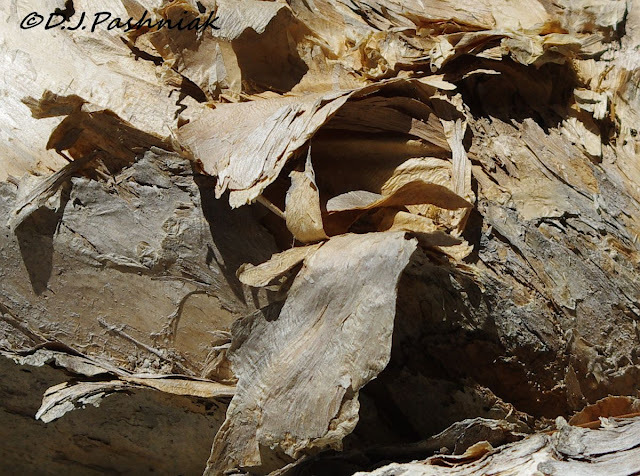 The bark is soft and peels off in sheets. 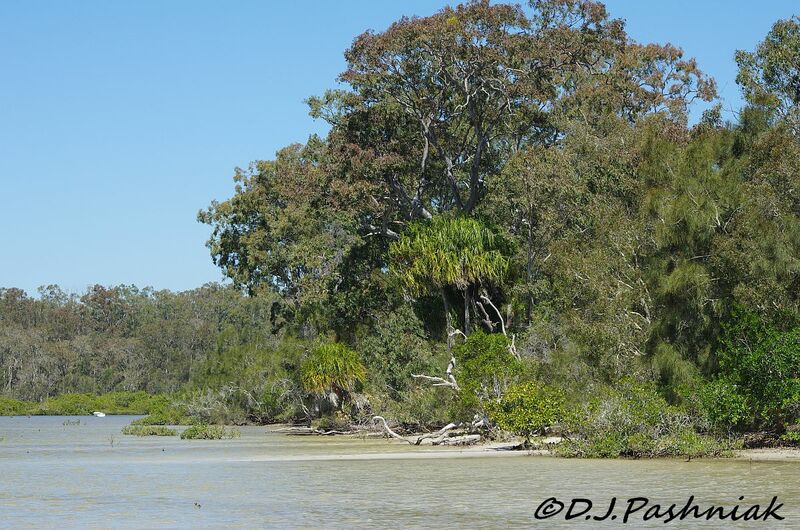 Much of the land immediately behind the beach is covered with forests of paperbarks. Where the land rises higher above the tide line there is a greater variety of trees.